It’s a question all children are asked at some point by their parents or teachers. But how many of us go on to follow the career we dreamed about when we were children? Nearly a third of adults who wanted to be a medic achieved their childhood ambition. Others who got their dream job included teachers (27%), writers or journalists (9%), police officers (6%), and actors (5%). This is a heart-warming story about a boy whose amazing imagination takes him on a journey to the moon. Got something in your eye? I think you’ll agree that it’s an emotional but hopeful film; very different from the kind of shock advert you may have come to expect from a charity. There’s a simple serious message here – that all children are born with the imagination to dream big and childhood should be a time when we’re free to dream. Abuse can destroy that – but it doesn’t have to. And the NSPCC provides services to help children just like Alfie, and their parents, to recover from domestic violence. In fact, according to its website, every year the NSPCC helps keep one million children safe from abuse and neglect, and more than ninety per cent of its funding comes from voluntary donations. Thankfully, most children don’t grow up under the shadow of abuse and are free to dream big, and as parents we can help them on that journey to pursue their ambitions. There were some unusual childhood dream jobs, including antique dealer, bus conductor, chip shop owner, dog trainer, hovercraft captain, gamekeeper, magician, opera singer, spy, and shepherdess.eleven archaeologists, ten farmers, seven artists, six chefs, and four jockeys! I wanted to be a zoo keeper or a vet when I was little; basically I wanted to help animals but I hadn’t properly thought through having to deal with all the blood and poo. So at some point I must have realised I was a bit squeamish and went off the idea. Of course since I became a parent I’d probably cope fine with all the mess. I don’t yet know what Little B will want to be when he grows up. He might want to be a chef. 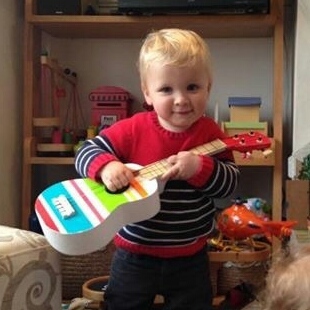 But he also has a love of music that runs in our family and I wouldn’t be surprised if I have to spend hours ferrying him to gigs in slightly dodgy London pubs when I’m old and grey. In the YouGov survey for those adults who lived out their childhood dream the support of parents and other family or friends were key to achieving their goal. It’s so easy to give that support and guide our children as they discover the world – and equally easy to send out messages of disapproval or that we think something is ‘silly’ or not a proper job. And if you’d like to donate just £3, you can text ALFIE to 70030 or click here to make an online donation. Great quote Phil. And thank you for reposting.